A 4-wheel drive truck driving on the beach in Carova NC. Yes, Carova and the other 4x4 Beaches are located just a few minutes north of Corolla, but the undeveloped 4-wheel drive beaches couldn't be more different! As you explore Carova and the other 4x4 Beaches, you'll experience a sense of unparalleled freedom. However, there are basic guidelines you must follow in order to stay safe. 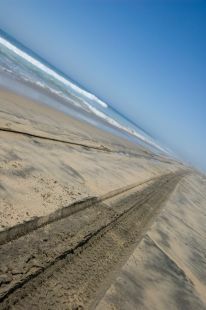 A 4-wheel drive vehicle is mandatory to visit Carova, Swan Beach and the other 4x4 Beaches. You may see photos of flat, packed sand and think you can make it in your all-wheel drive vehicle or mini-van. Please take this as your official warning - Don't risk it unless you want to make friends with the local tow truck driver! 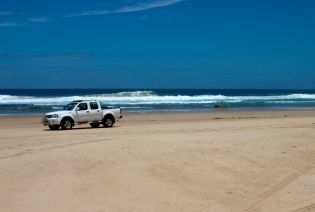 Tides and sand conditions can change rapidly, which greatly affect the drivability of the 4x4 Beaches. Even in a 4-wheel drive truck or SUV, you still need to follow the tracks of other vehicles and lower your tire pressure to 20 psi. You'll usually find rows of parked vehicles lined up in sand. There is plenty of room to spread out, and if you drive further north towards Carova, you'll likely find a huge section of beach all to yourself. Just be sure to keep an eye on your kids and pets at all times - keep in mind that traffic will be moving back and forth along the beach. Note that there are no fixed lifeguard stations on the 4x4 Beaches. There are roving 4-wheel drive and ATV patrols on duty from 9:30-5:30 daily from Memorial Day to Labor Day. Please review our complete list of Outer Banks beach safety guidelines for information on red flag warnings, rip currents and other ocean safety issues. Drive safely on the 4x4 Beaches and Carova NC. A 4-wheel drive vehicle is mandatory. Lower tire pressure to 20 psi - be sure to bring a tire gauge. Avoid driving in the ocean - salt water is extremely corrosive. Slow down to 15 mph when near people, pets and wildlife. Do not drive on the beach after dark - it is difficult to see hazards and you can easily become disoriented. Drive during low tide - check the tide charts before heading to or from the 4x4 Beaches. Drive on the hard-packed sand and follow the tracks of other vehicles. Watch for stumps sticking out of the sand. Long ago, the area was a forest and the remains of trees still poke through the sand at times. Park above the high tide waterline - pay attention or your vehicle could get flooded! Always be alert for kids, pets, beach chairs, parked vehicles and fishing lines while driving. Avoid driving through large puddles on the back roads - you don't know how deep they might be. Bring a small shovel along in case you get stuck. The pristine 4x4 Beaches are beautiful and exciting, but please always put safety first. Exploring Carova and the other 4x4 Beaches requires a high level of responsibility and common sense. Have fun and be sure to send Sun Realty photos from your adventure!